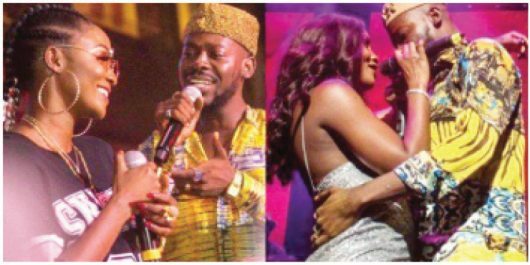 The news of traditional marriage between popular singers Adekunle Gold and Simi has stirred reactions from Nigerians on social media. The traditional wedding between both singers held in Victoria Island on Wednesday, with exclusive 300 guests in attendance. Some of the celebrities present at the wedding ceremony include Falz, Do2dtun, Smade, Praiz, Olamide, Moelogo, Pheelz and others. However, it was gathered that celebrities were banned from taking pictures at the wedding. But a video of the couple dancing emerged online. It is recall that the singers secretly got engaged in December. The engagement was reportedly attended by only close family members and photos were not allowed at the events. Their wedding has since stirred reactions from Nigerians who wondered how Adekunle Gold and Simi were able to keep their relationship a secret. Beyond no wedding pictures, famz knew about the wedding as far back as October 2018 but kept it under wraps! @Paulaaudrey “Congrats to Adekunle and Simi! Their love story is a Masterclass on how to date when both of you are famous and evolving in the same lane. Happy for them and can’t wait to see the wedding pics today! !